Multimodal Symphony from Will Geary on Vimeo. New York’s subway ridership has been up in recent years, but so are delays thanks to ancient infrastructure in desperate need of upgrading. One major system component that needs to be modernized is their signaling equipment. Signals coordinate the movement of trains — kind of an important thing for riders if you don’t want trains crashing into each other. Modern, computerized signal systems are more dependable and exact, which means trains can travel with less space between them, allowing for more frequent service. It’s also safer because trains can be stopped automatically. Mr. Barone, of the Regional Plan Association, argues that New York should schedule longer closings to finish the work more quickly. Mr. Van Bramer agreed that it would be better to simply “rip the Band-Aid” off by doing all the work at once. Wynton Habersham, head of the subway department at the transportation authority, said he would prefer longer closings, too, but the agency has to weigh the impact on riders. Metro also sees its fair share of maintenance. Our system isn’t quite as old as New York’s, but it’s not young anymore either, and we’re trying to keep ahead of issues that could lead to major shutdowns — even if it means the maintenance work must sometimes be done during off-peak service hours. It’s also worth noting that Measure M has funding set aside specifically for state of good repair. And while I know from personal experience that maintenance schedule can be a pain in the rear, it’s worth it if we can one day become the wonderland that is the London Tube. 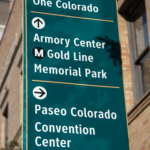 Since a majority of people reach their bus or train stop via walking, wayfinding signs showing how near or far stations are should go a long way toward leading more people to transit. I, for one, appreciate seeing them around Pasadena. Let me know in the comments: are there transit wayfinding signs in your neighborhood, and if not, would you like there to be? Check out the new and improved @metrolosangeles trains running on the Blue Line starting today. I’d like to see more transit wayfinding signs in LA. It can be hard to even find the bus stop sometimes, especially at night, as the signs are often inconspicuous. It’s especially confusing if an intersection serves more than one route, but I need to stand at a different corner to catch the right bus. I think the wayfinding signs would be appreciated, and would help to make the system seem less intimidating to potential new riders. I’ve seen a few wayfinding signs in downtown Santa Monica directing people to the Expo station. I’d imagine this was a no-brainer for the city, since they already had these signs and maps for the various tourist and shopping destinations in the area. As I remember from last time I was in New York, they’re important for out-of-towners who might not know which direction they’re facing. Wayfinding signs are not only useful, but also act as an advertisement for the system. Sometimes you don’t even know a station is near without them. Pretty interesting & nice video though all those yellow dots is misleading……..
Where was the Prom photo taken? Here at Union Station! The high school students took Metrolink to Union Station, then transferred to the Red Line to go to Hollywood.